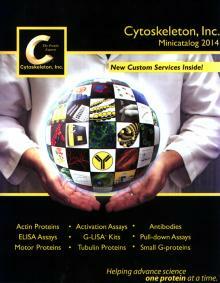 Cytoskeleton, Inc. is pleased to offer a wide range of kits and products for drug screening, signal transduction and cytoskeletal research. We specialise in the production of purified proteins and easy-to-use kits to study biochemical and cellular processes. Our kits are either made for smaller number of samples for use in basic research or small screens (Biochem Kits™) or in a high throughput scale for large screens (CytoDYNAMIX Screens™). Because our scientists have many years of experience working in their respective areas of expertise, we are able to provide products of exceptionally high quality. Since the start in 1993 we have gained a reputation for producing quality products at a reasonable price. Indeed, our products have been used in many hundreds of scientific publications. In addition to our existing products, we provide drug screening services for microtubules, tubulin and several other proteins in our product line.